Stress and Anxiety are both key issues that lead to serious health problems and undoubtedly, massage and bodywork can help to manage these conditions. Here at East-West we integrate therapies that reflect the wisdom of both Eastern and Western philosophies to create an individualized holistic treatment to meet your specific needs. At East-West we look forward to supporting you in your quest for optimal health. Our treatment center is available by appointment. We are also providing mobile massage services so that we my bring our healing services to your home or office. 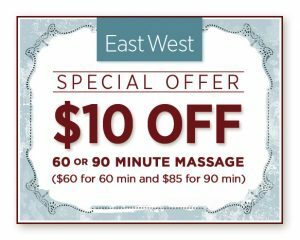 East-West is now offering a 1 hour massage treatment at an introductory price of just $55.